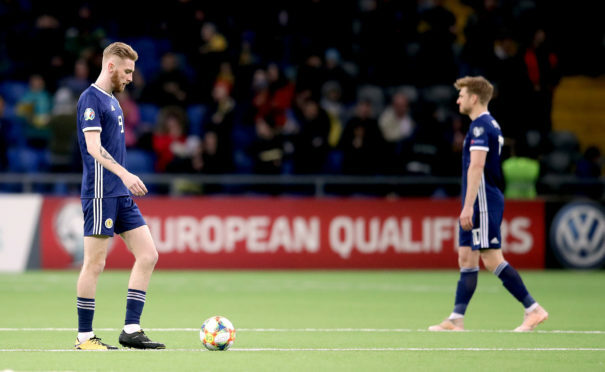 It was a miserable start to the Euro 2020 qualifiers for Scotland as Alex McLeish’s side lost 3-0 to Kazakhstan. The Scots were stunned by two goals in the first ten minutes from the side ranked 117th in the world. And things were to get worse after half time, with a third headed in just six minutes after the restart to compound the humiliation. In chilly temperatures in the Kazakh capital, Scotland’s defence froze in the opening minutes as a ball split the defence, allowing Yuriy Pertsukh to smash past Scott Bain from 18 yards. Things went from bad to worse after ten minutes as Yan Vorogovskiy took advantage of a lapse from Graeme Shinnie, filling in for Andy Robertson and Kieran Tierney at left back, to run in at the back post and double the home side’s lead. It was a dreadful start and the first half saw Scotland completely outclassed by their hosts. Six minutes into the second half came the third, with Aberdeen’s Scott McKenna outjumped by Baktiyar Zainutdinov in the box, angling a header into the opposite corner. While Scotland tested the Kazakh keeper a couple of times, it was a dismal defeat – with many labelling it one of the worst ever.